Have you got yourself a canine Houdini? Or do you live in a neighborhood with a lot of road traffic? Maybe you’ve got a curious puppy who can’t be trusted near the neighbors’ trash cans? Wireless dog fences are a modern solution for puppies who love to roam. If you’re not warming to the idea of a big ugly fence in your yard, you might be wondering whether a wireless fence is the answer for you. As there is such a huge variety of fence types these days, we summarize the different features and give you some recommendations to help you make the best possible choice. 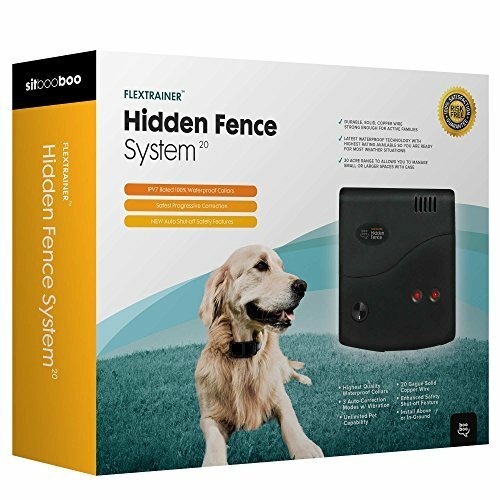 What is a Wireless Dog Fence? Why Might I Want an Electric Dog Fence? Will an electric fence and collar hurt my pet? 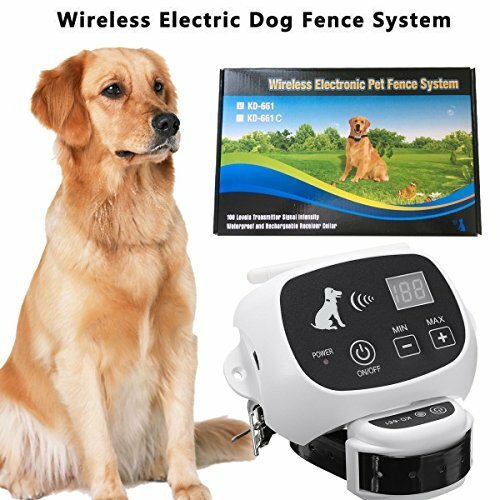 When can my puppy be trained with a wireless dog fence? Someone told me their dog just ran through his fence. How can I avoid this? As dog owners, there are many reasons an electric dog fence might be useful. Of course, there are pros and cons to getting one fitted, but first, let’s look at what they do. Wireless invisible fences are installed in your yard as an alternative to real wire or visible fences. Some work through transmitters that you place in certain locations, they are paired with a collar that your puppy wears. 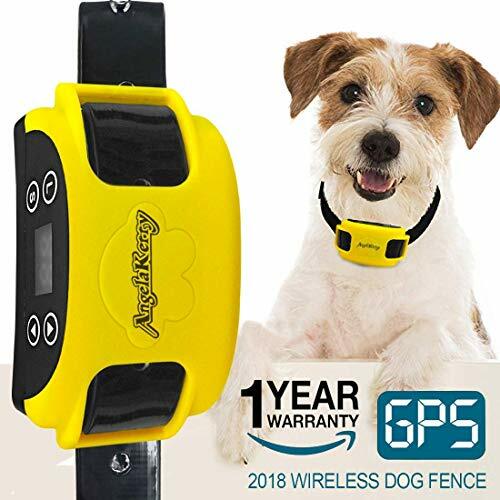 If, or when, your little one gets too far from the area set out by the fence, they will feel a small current through this collar as a warning. 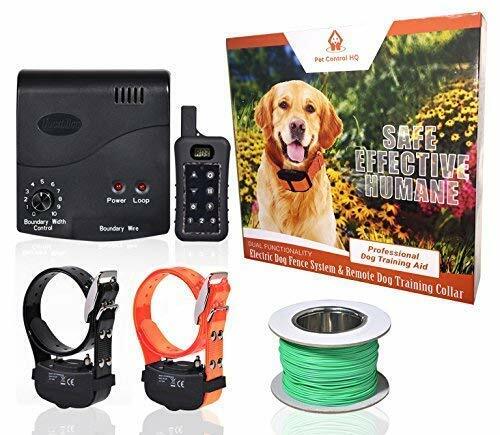 You can also get an electrical fence with settings for audible warnings instead of electrical shocks, but either way, some form of ‘response’ or ‘correction’ will give your dog an idea that he’s beyond a certain point. Wireless dog fences are designed to keep your puppy or dog from straying too far from the house. If he loves running around and having a good time in the yard, wireless or electric dog fences (sometimes called invisible dog fences) can keep your fluffy friend from wandering away into the street. Or into the neighbor’s garden! The ‘technology’ for the fence itself, which we’ll look into shortly, usually goes underground, although these days, there are several different types to choose from on the market. This is the main big difference between wireless dog fences and regular fences, and also why they’re often called invisible dog fences. To keep your little dog from roaming, electric dog fences come paired with a collar that goes — of course — around his neck. If your four-legged Houdini gets too far from the boundary you’ve set more than a few times, he’ll learn to treat the mild electrical ‘buzz’ as a kind of warning. In time, this will train your pup not to leave the zone that marks your garden, yard, or driveway, for example. You love your puppy very much, don’t you? We’re sure you do, but your neighbors may not be aspatient when it comes to him rolling or digging on their lawn. If you’ve got a very energetic and playful pup, for one, an elderly neighbor may not appreciate having to clean up after it in their front yard. If you live in a street where cars, vans, or even just bikes, frequently come past, a fence keeps your dog safely out of harm’s way. Puppies that stay in a certain ‘safe’ area have little chance of getting into an accident or scared by the noise of a close oncoming vehicle. While you may have a fully vaccinated, healthy, friendly puppy, there is still always a risk that other dogs might not be as well looked after. Keeping your puppy inside a certain area means he’s less likely to get into fights with other dogs, or even catching something infectious from a wild animal. Most electric dog fences are variations on one key theme. Some you will need to bury underground, some are more like plug-and-play fences that can be moved around. Some are technically underground electric dog fences, but can be used above ground — you get the idea! At this point, if you already know all about how the difference fence types work, you can skip right ahead to our reviews. These require you to dig down and lay a wire that will form the boundary for your dog. They have a transmitter (often, it looks a bit like a box) that links with the wire you have just laid, and this sends invisible signals to your puppy’s receiver collar. As the name suggests, these don’t usually require you to dig. They use GPS technology, WiFi, or radio waves to send and receive signals from your dog’s collar receiver. Compared to GPS and radio wireless dog fences, WiFi systems can expand over a considerable coverage area, but both often boast portable transmission systems that can be moved around. 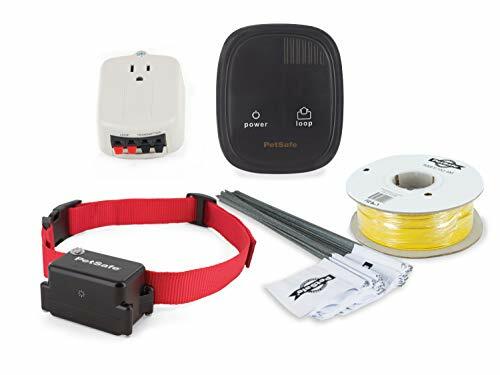 Where underground electric fence transmitters often are stuck to a wall or attached somewhere permanent, wireless fences are frequently easy to take away on vacation. Whether you have got a suitable ‘center’ place for your transmitter. 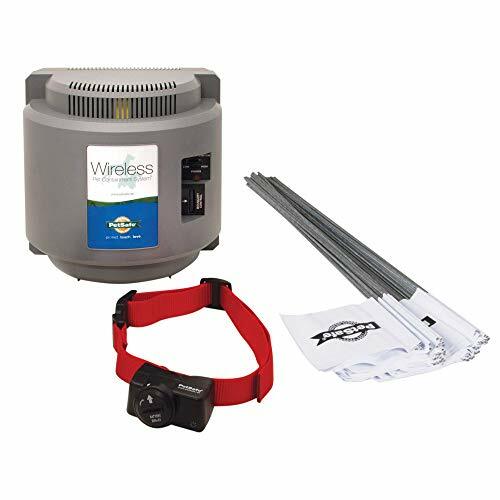 There are a few more things to keep in mind when buying a wireless or underground dog fence. Because all the dog fences we’ve mentioned use collars, you’ll need to think about whether it’s the right size for your puppy, and factor in how fast he’s growing. A fence that comes with an adjustable collar is often a good choice, although you’ll also need to see if it’s suitable for long-haired dogs such as Shih Tzu or Collies. Receiver collars sometimes have points of contact that will need to sit against your dog’s skin. Often, manufacturers add in features to ensure that longer-haired breeds can still use their collars and systems effectively, so keep an eye out for this. Is it waterproof? Is another question you should ask yourself, especially if you have a puppy or dog who loves to splash about. Even if you don’t have a pool or similar, a waterproof collar can be a good idea to ensure a longer life against the rain. Have you got more than one puppy or dog? Or are you open to growing your canine family? If so, you’ll want to look out for a fence that supports multiple collars. Some great options can be found in our reviews, which allow an unlimited amount of dog collars to be used within the same fence. Of course, you may be happy to invest in the very best underground dog fence, and it can be a great idea if you value peace of mind and reliability. However, if you are not sure whether you might move in the near future, you may find that you either have to carefully dig it up or find an alternative solution for the interim. Given that some fences take hours to install (despite being well worth it), you want to think about this carefully before you commit. Others’ reviews – it’s good to look at what other pet owners have to say about a battery. You may find a collar with an absolutely brilliant, reliable, and long-lasting battery, but then realize that replacing it will be a little bit above your personal budget. Last but not least, different fence systems can offer more or less variety in terms of ‘static options’. This means that some set-ups allow you to adjust the different stimulation levels that your dog will feel when he goes close to or crosses the fence. The ability to adjust the static on your dog’s collar (usually through the transmitter box) can be helpful if you want to have greater control over training. It’s just as important if you’re trying to ensure that your dog isn’t receiving an uncomfortable level of sensation for their body mass. For example, some systems will have 5 controls, some will offer up to 8, and some will also include an ‘audio-only’ setting. Best ‘Escape Artist’ Fence, for those with Houdini-like pooches. Here, we have included wireless dog fences that work via GPS and some with radio waves. Some are suitable for small little areas inside the house, while others (mostly the GPS ones) are better for outdoor purposes. Regardless of the specific tech they use to operate, these are all portable and offer a circular play area for your furry pal. With zero digging involved, yay! The PetSafe Wireless System has a 90 feet radius coverage area, meaning you can cover a total of 0.75 acres with this fence. It doesn’t go under the ground, so meaning it is much quicker to get started than with some other systems that might require digging. As long as you have enough collars, you can add as many puppies or dogs as you please to this system. This system only allows you to cover a circular-shaped area, so may not be useful for some properties. 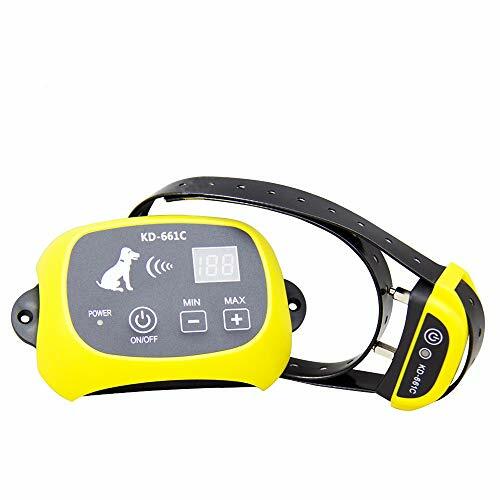 A GPS system for your dog that offers adjustable static intensities and a circular coverage of up to eight hundred meters radius. 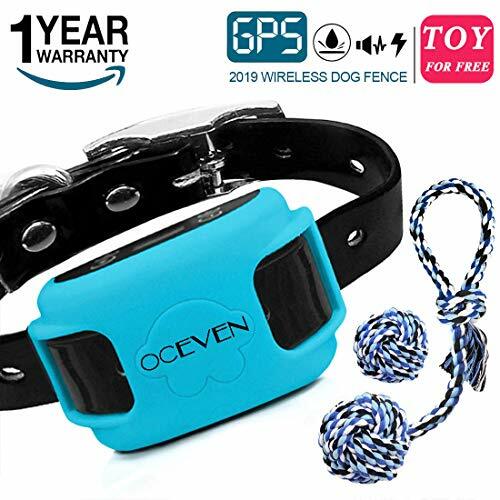 Comes in a cute blue collar and with a ninety-day full-refund guarantee, plus the manufacturer’s assurance of improved anti-interference technology for the GPS. The radius can be adapted to smaller areas (20 meters) and 800 meters for larger spaces. Easy to use out of doors, even in the park, and the kit comes complete with cute little dog toys! Like most GPS fences, this isn’t immune to the effects of bad weather or tall buildings. With a radius of close to 105 feet, the Stay + Play is a portable solution for smaller dogs. By portable, we mean it only takes a very short while to set up the whole fence perimeter and cover an area of about 0.75 acres. 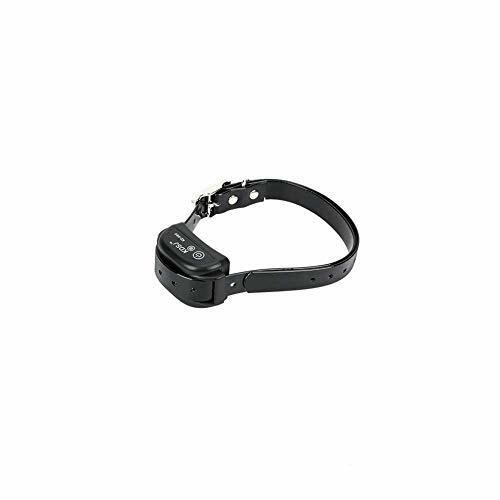 Collar type – Rechargeable receiver doggy collar, waterproof. This comes with different ‘correction’ levels, as well as the ability to switch between static and audio-only signals when your dog strays. Ideally, the idea is for your dog to become accustomed to the markers or flags that you use, so you can ditch the static shocks entirely. It’s compact and super-simple both to take away on trips and to recharge. It’s slightly more expensive than some other solutions, but if you travel a bunch with your pet, that may be well worth your while. This fence and collar system uses GPS tracking technology instead of radio waves to set out an area of almost 500 acres from the center point. 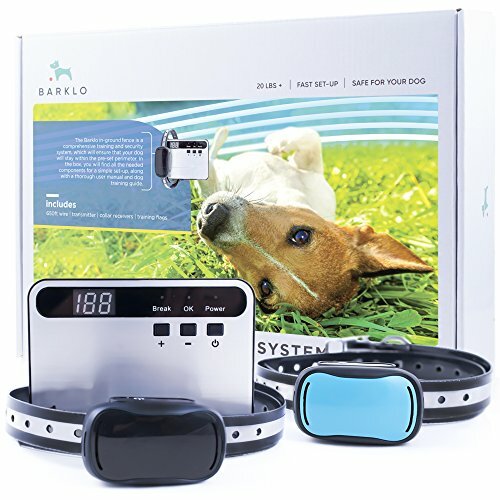 It offers eight hours of operating time and takes only two hours to be recharged, and also has the technology to avoid overstimulating your pooch. You can adjust the radius for the area that your dog’s allowed in, between 22 and 875 yards. Usable wherever there’s GPS outdoor coverage, so you can take it on the go to many places. Because it uses GPS, it is not necessarily as effective in bad weather, indoors, or if you live in an area with many high buildings. Set out a radio fence to cover a half-acre circular area for two dogs with one of the most popular wireless fences on the market. 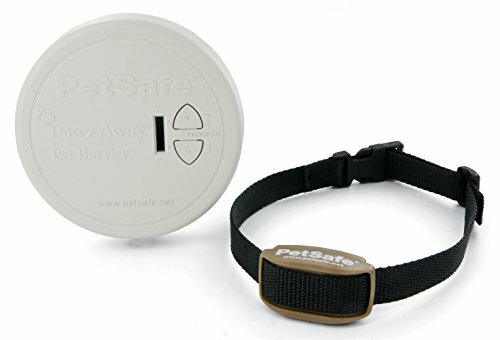 The PetSafe PIF 300 has been around for ages and ages and it comes with a light collar and a transmitter which is easily plugged into the wall inside your house. It’s portable, too, so easy to take on trips or similar. Collar type – Waterproof, with a 6V proprietary battery, non-rechargeable. 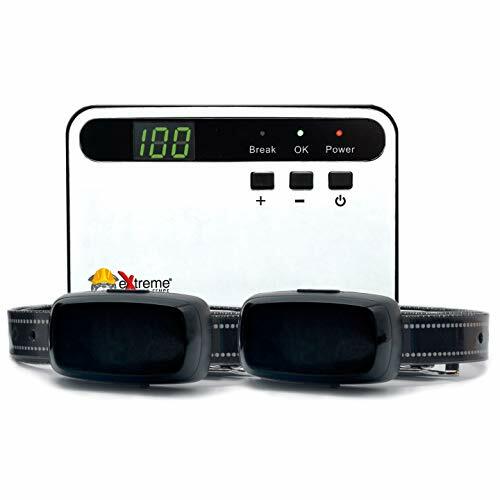 PetSafe is a reliable brand that’s well-established, meaning the receiver collar batteries are easy to replace, and customer service is good. Super to take away with you on vacation, where you can simply plug the unit inside the building and follow the clear how-to instructions to set it up. The battery life for the receiver collar itself is a little bit short, with most users reporting two months between replacements. If you are on a tight budget, buying replacement (proprietary) batteries can add up. 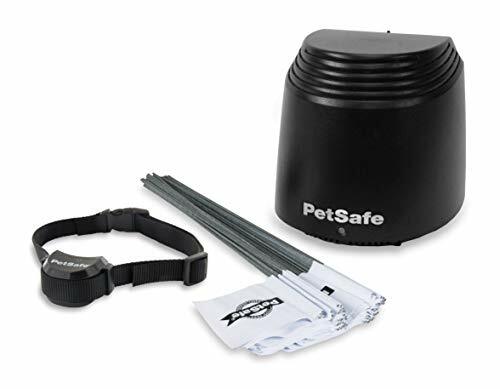 Quick and easy to set up, this CarePetMost fence can support two rechargeable collars. You can even use it on smaller pets, such as cats, because the collar is adjustable and the static settings can be changed around, too. One caveat is that dogs under four pounds, such as toy Chihuahuas or Poms, may be slightly too small for this collar. Collar type – Rechargeable, with its own charger and around 9 hours of battery life between charges. You can use this for large-breed dogs and giant dogs because the collar is adjustable. The radius is also adjustable, ranging between ten meters and half a kilometer. So, you can take it on holiday with you, or use it to keep your dog away from the pool. Only two dogs can be contained in the fence, and you’ll only get one collar in the package. Of course, you can always order another! Zero digging or underground cables, this fence system uses 433 MegaHz technology to offer a 533 yards radius for your dog. It also comes with a built-in safety system that stops stimulating your dog after it has been on for a while. It comes with a simple plug-in transmission unit and one collar. Super easy to install, according to the instructions and reviews, and offers a wide radius for your dog’s play zone. It has a graduated ‘correction system’ from audio to weak stimulation, to stronger. This means your dog won’t receive unnecessarily harsh static reinforcement when he’s simply approaching the barrier. This hasn’t been reviewed a lot, so there is a not of feedback for you to make your purchase decision. This is a nifty wireless option that lets you set barriers pretty much anywhere. Does your puppy have a weird habit of rooting around in the garbage? Does he always seem to be too close to the neighbor’s fence? It has an adaptable radius of between two and twelve feet and the collar uses proprietary PetSafe batteries. Economical both as a one-off purchase, and to replace the batteries in the transmitter (it uses generic AA cells). Super-flexible in terms of keeping pooch away from specific places. This specific model is for indoor use, although there are some other options available for outdoor and ‘threshold’ applications. This is a fence with a large perimeter to cover up to twenty-five acres. The transmitter is capable of working with a large number of dog collars, and the battery has been designed to last for between 4 and 6 months before it needs to be replaced. Extreme fence also has US-based customer service, if that is something you find useful. 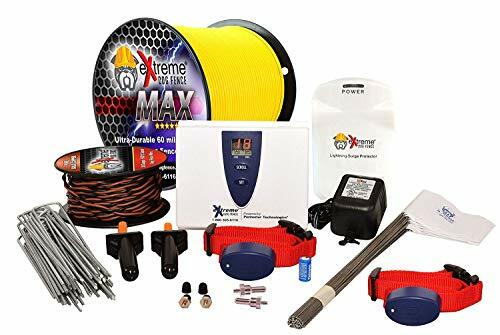 The fence itself doesn’t technically need to be buried under the ground, as the wire is made to be weather-resistant and the whole setup comes with a surge protector. You can install the fence yourself without too much trouble at all. Which is an especially good point for an underground fence, as they can sometimes be a bit tricky. It’s a pricey option, but if you’re in it for the long haul, it is built to last. 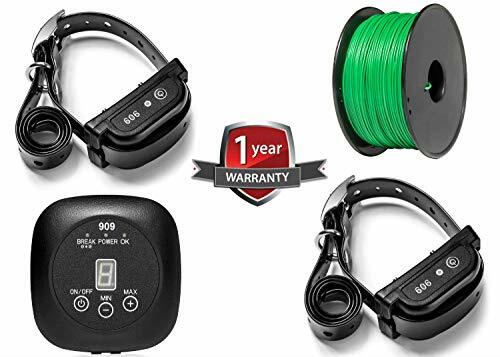 This Dogtek electric fence offers eightseparate correction settings, entirely waterproof collars, and offering 5 acres of perimeter for your puppy or dog to run around in. As well as being an underground fence, this can also be used above ground or elevated if you have a fence already and just want to upgrade. It’s possible for owners to adapt and adjust the fence distance without changing the distance at which your dogs’ collars go off (‘warning’ distance). Use multiple—in fact, any amount of—collar receivers for just the one fence. Customers have raised some concerns about the collars wearing out or collars that cease working after a short period of time. 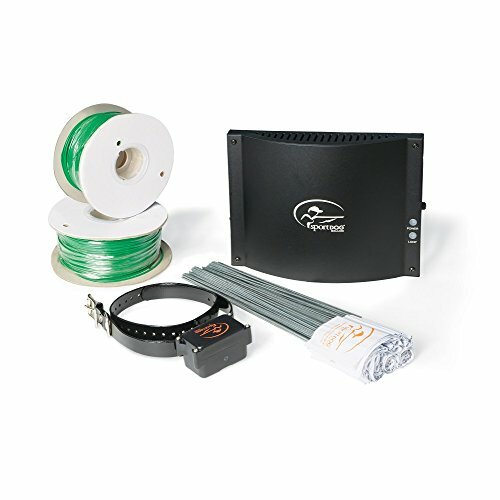 A higher wire gauge means better quality for your underground fencing, and this SportDOG in-ground system offers 20-gauge wire for longer life. You get 1000ft of perimeter wire to create more than 1.3 acres of land, and the wall-mounted transmitter box has surge protection fitted against lightning interference. Any number of dogs with the relevant collar be contained within one fence, which is convenient if you’re going to be digging up the ground! The receiver itself has quite a large and clunky battery, which may not be as comfortable for your pooch as some other brands. This invisible underground fence is a newer model of an older COVONO, and as such has been updated with improvements such as ‘speed detection’ for when your puppy may be rushing the fence. Any number of doggies can be kept inside this multi-receiver fence. Quick to install in a few hours, with clear instructions to help you along the way. ‘IP66’ level of waterproofing means the collar can even be worn while your dog has a swim! Comes with a smaller boundary than some other fences, covering only 0.75 acres. As with most other electric fences, of course, you can easily purchase more wire and extend this area. This customizable electric fence can be put under the ground or above, it’s up to you. You can also loop the wire around to contain different areas, for example, to separate two dogs who might tend to fight. It comes with a remote if you want to train your dog when he’s off-leash and offers ten different static levels. The ‘two-collar’ package may be a little confusing because this does not mean two dogs can be contained within the one fence. Instead, it means one dog can stay within the fence, and another collar can be used to train using the remote. Switch between four static correction levels, as well as audible and vibration correction options for dogs who can’t hear very well. This fence covers 0.33 acres before you need to buy more wire, so well suited for smaller properties. With compatible collars, you can easily keep as many dogs as you’ve got inside this one fence. With some exceptions, this includes most of the PetSafe range, even from other models. Good alternative to tethering for most escape artists or difficult-to-train dogs—instead of tying them up, this offers high static power, training them quickly rather than repeatedly, to down the number of static corrections they get. While it isn’t technically a product flaw per se, some real Houdinis and giant breeds still can’t be stopped with this fence, choosing to sprint through instead. This fence can be ‘looped’, meaning you can cordon off separate parts of your yard or property. Useful if you have a pool or two yard areas, for example, or prized flowers! Very simple to install and comes with two collars. Collar type – Lithium battery-powered, adjustable, rechargeable and waterproof. Good and responsive customer service from the manufacturers, which is very helpful if you’re going to install the invisible dog fence yourself. Some customers have experienced collars that stop working after a short period of time. 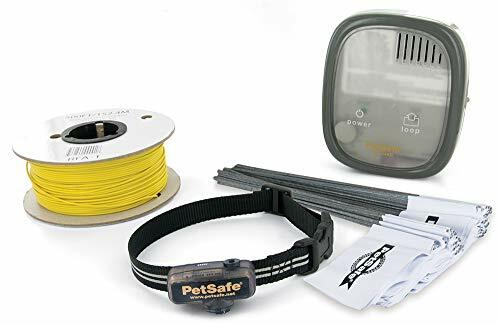 PetSafe Elite Little Dog In-Ground Fence for Dogs and Cats, Waterproof, Tone and Static Correction, for Pets Over 5 lb. Like some other PetSafe collars, this offers 4 correction levels (static) as well as a tone/sound-only setting. It covers 0.33 acres and is great for smaller breeds, with a lightweight and adjustable collar for necks as small as 6 inches in diameter. While the battery needs to be replaced every one to three months (your mileage may vary), the collar itself does not fall apart easily like with some other dog fences. It is not as simple as some other brands to install. The wire that comes from the manufacturer may not be as high in quality as some other products. Here’s another fence that can be looped and customized according to the area you’re working with. It also features 20-gauge perimeter wire to fence in 0.75 acres of space. 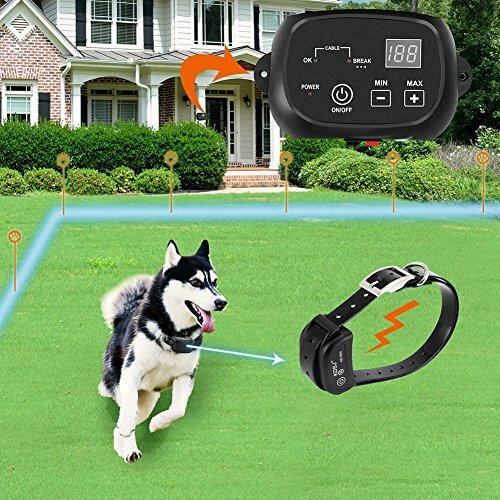 It also has the speed-sensitive functionality to detect and correct your dog when he rushes toward the boundary. The wire may not be thick enough to avoid breakage in all different land types. Five hundred feet of wire come with this in-ground fence, offering a generous perimeter for most home properties. It’s got a combination of audio, vibration, and static options, and can cover twenty acres if you add extra wire. It’s an ‘all kinds of weathers’ fence! So, as well as having submersible collars, it will hold its own against snow and rain. Rechargeable batteries for the doggy collars mean you don’t have to replace them with expensive parts. Some people are saying that the collar sets off even well before the dog reaches the fence, although this may be due to set-up. 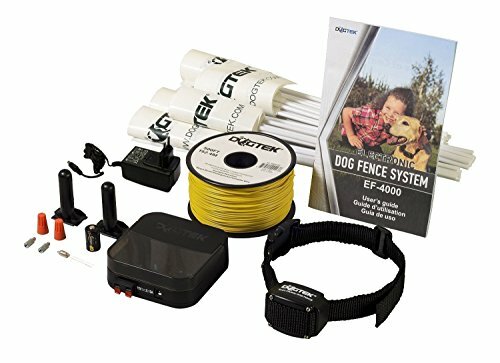 This in-ground fence by eXtreme Dog Fence is a basic, kind of like a starter kit that you can use to see whether a fence works for you. It can support any number of dogs within the one system, a feature-packed transmitter unit, and different kinds of flexible fencing options. Collar type – Rechargeable, waterproof, for dogs with necks between 10 and 26 inches wide. This is an affordable price for an underground fence, from a well-respected brand, plus, it comes with five years of warranty. Clear and easy-to-follow setup instructions. None that we can see! The static ‘correction’ that a receiver collar gives your dog is not designed to cause him pain or harm. It’s definitely not designed with the intention of injuring your little one. Rather, these ‘impulses’ or stimuli are meant to be a bit uncomfortable and act more as a warning. You may like the sound of some of the fences we have reviewed, which use ‘graduated’ warnings. These use audible tones, slightly starting noises or vibrations that your dog will hear or feel when he gets close to the fence. While he may feel a shock one or two times throughout his training, many dogs will quickly learn not to try again. You may also want to be aware that customizable correction settings allow you to tailor the static impulse to accommodate for different doggy sizes. What is effective for a large dog may be too much for a little pooch, so read your instruction manual carefully, and always start on the lowest setting. 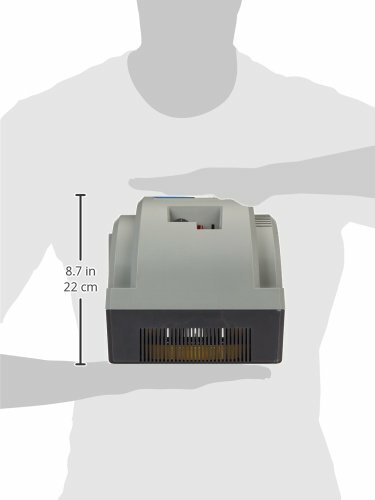 It may also help to try the collar on your own arm, to get a sense of the static sensation. Never train a young puppy with your electric dog fence before he is at least two months old. Around this time, you will probably be starting to train him in other ‘elementary’ things, like how to sit, come, or even fetch. At this age, they also have the grasps of what we call ‘operant conditioning’, which is the idea of changing his behavior based on reinforcement from the environment. Being able to use commands like ‘Stay’ or even ‘Stop’ are also very helpful as part of the whole training process. This has been known to happen, and electric dog fences are not a magic bullet. They require that you keep them in good shape and follow the manufacturer’s guidelines. This means checking that you haven’t damaged or broken any of the wires for your in-ground/underground fence by accident or because it is very old. Choose a strong gauge wire, and ensure you lay it out properly. Your pup’s collar may also have run out of battery, meaning you either need to replace it or recharge it depending on what fence you have. Last, but not least, check that everything which should be plugged in is plugged in. Sounds silly, but it wouldn’t be the first time a vacuum cleaner wire or similar has loosened the connection to the wall! What’s the Best Food For Chihuahuas? What’s the Best Food For Golden Retrievers?